Establishment of the tool-workpiece contact, in which the diamond tool is set on the workpiece surface with a small contact force, determines the depth of cut accuracy in a force sensor-integrated fast tool servo (FS-FTS) for single point diamond microcutting and the scan force and scan depth in the following step of on-machine surface metrology. Molecular dynamics (MD) simulations are carried out to characterize the tool-workpiece contact process. 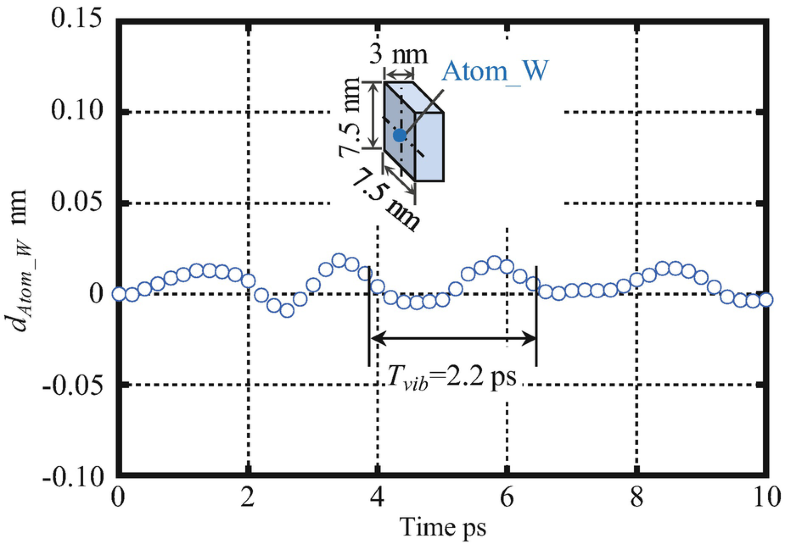 It is clarified that even a small instability induced by the vibration of the workpiece atoms can generate large uncertainties in the subnanometric MD simulation results. Based on the vibration of the workpiece, atoms have a certain period determined by the MD model size; a multi-relaxation time method is proposed for reduction of the atom vibrations and stabilization of the MD model. 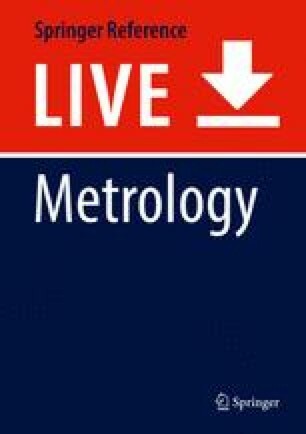 It is confirmed that the proposed multi-relaxation time method is effective to eliminate the instability over a wide temperature range up to room temperature under which a practical microcutting or surface metrology process is carried out. An accurate elastic-plastic transition contact depth is then evaluated by observing the residual defects on the workpiece surface after the diamond tool is retracted back to its initial position. 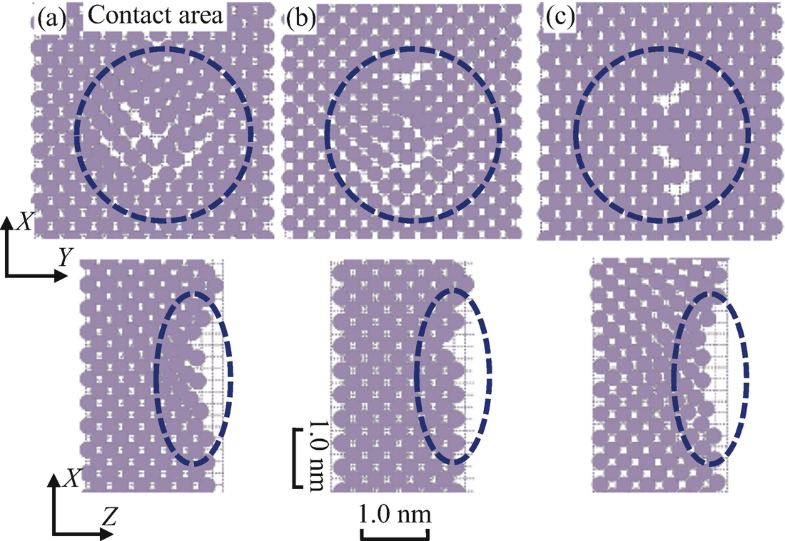 Ultraprecision diamond microcutting is widely employed for fabrication of high accuracy microstructures over large areas of diamond machinable materials (Gao et al. 2003; Brinksmeier et al. 2012; Mellor et al. 2013; Fang et al. 2013; Chen et al. 2014) by using a single point diamond tool on a diamond turning machine (Gao et al. 2007; Lee et al. 2011) or an ultraprecision lathe (Cheung and Lee 2003; Chen et al. 2015b, 2016). The increasing demand for devices and systems with nanometric size and nanometric or subnanometric accuracy has pushed the machining accuracy of the ultraprecision diamond microcutting and its following step of surface metrology to the subnanometric range (Sun et al. 2012; Cheng and Huo 2013). In the conventional FTS-based microcutting, in order to generate the complicated tool paths corresponding to the designed microstructured surface forms, the fast in-feed motion of the diamond tool is controlled by a PZT actuator of the FTS in association with the slow cross-feed motions of the machine axes. The tool path can be generated with nanometric accuracies by the well-developed PZT and the ultraprecision machine tool technologies. However, the accuracy of the machined microstructured surface is significantly affected by the cutting conditions. Therefore, a force sensor-integrated FTS, which is referred to as the FS-FTS, has been developed to assure and improve the machining accuracy of the FTS-based microcutting (Noh et al. 2008; Gao et al. 2015). The developed FS-FTS also has a unique function of in-process measurement of microstructured surface form. After microstructured surface is fabricated by a diamond tool, which is controlled by the FS-FTS and the machine tool slide, the fabricated microstructured surface can be scanned with the same diamond tool by using the FS-FTS and the machine tool slide to generate the scanning motions. The position of the diamond tool tip along the depth of cut direction is servo-controlled by the PZT actuator of the FS-FTS, so that the contact force between the diamond tool and the workpiece surface is kept constant. The contact force is monitored by a force sensor of the FS-FTS. A displacement sensor of the FS-FTS is employed to measure the servo-controlled PZT motion. The microstructured surface form of the workpiece is then accurately reconstructed from a combination of the PZT motion and the machine axes during the scanning motion. This function has been employed for a set of on-machine surface metrology, including on-machine measurement of diamond cutting tool edge contour (Chen et al. 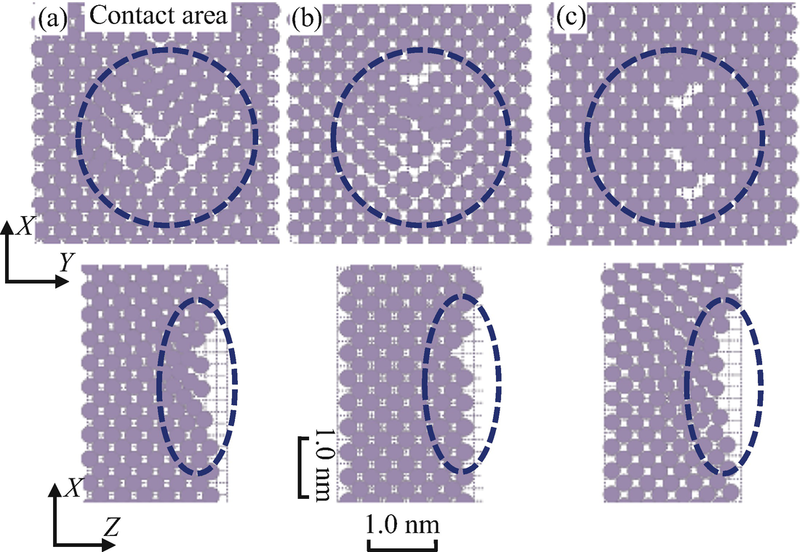 2015a), relay fabrication of microstructure array (Chen et al. 2014), and in-press detection and repair of micro-defects (Chen et al. 2015b). Establishment of the tool-workpiece contact, in which the diamond tool tip is set on the workpiece surface with a small contact force, is the first step for microcutting and on-machine form measurement based on the FS-FTS. The tool-workpiece contact determines the depth of cut accuracy, which significantly influences the achievable machining accuracy of the ultraprecision diamond microcutting and the scan accuracy of the on-machine surface metrology. For establishment of the tool-workpiece contact, the diamond tool is brought toward the workpiece surface by controlling the machine tool slide or the PZT actuator of the FS-FTS, while the output of the force sensor of the FS-FTS is monitored simultaneously. The tool-workpiece contact is established when the output of the force sensor reaches a threshold value. Ideally, it is desired to establish the tool-workpiece contact within the purely elastic region of the workpiece surface so that the accuracy of the ultraprecision diamond microcutting and the integrity of the scanned microstructured surface can be maintained. In responding to these requirements, it is necessary to physically understand the elastic and plastic deformation behaviors of the workpiece material in a subnanometric range when the workpiece surface is contacted with the diamond tool with specific cutting edge geometry and make clear the threshold contact depth and the corresponding contact force of the subnanometric tool-workpiece contact. Elastic contact is a traditional problem, which can be investigated by the classical contact mechanics based on the Hertz theory (Johnson 1985; Oliver 1992). However, as the contact depth goes down to the nanometer-scale and the contact phenomenon takes place in a limited region, the conventional continuum theory cannot provide a reasonable explanation in such a small scale because of the nonlinear constitutive equations and the complicated material parameters (Oliver 1992). The instrumented nanoindentation systems have a capacity of measuring the mechanical property of thin surface layers such as coatings and thin films (Page et al. 1992; Gao et al. 2000; Motoki et al. 2006; Huang and Zhao 2015). Typically, a Berkovich-type diamond indenter with a large tip diameter of several micrometers is used in the nanoindentation system. A diamond tool, with a nanometric cutting edge formed by a flat rake face and a conical or cylindrical clearance face, is not compatible with the nanoindentation system. Therefore, the diamond tool is not compatible with the indenter in a nanoindention instrument. The current version of the FS-FTS instrument is also difficult to be employed for the subnanometric indentation experiment due to the insufficient performances of the machining instrument. On the other hand, simulations on the different time scale and length scale have become powerful approaches to analyze the deformation mechanisms of various materials, such as finite element method (FEM) (Özel and Zeren 2004; Farzad and Abdolreza 2015), multiscale simulations using quasicontinuum (QC) method (Wang et al. 2008), and molecular dynamics (MD) simulations (Goel et al. 2011, 2015). In spite of MD, simulation suffers from the limitation on both time scale and length scale; yet, it has become a powerful approach because it enables to predict and analyze the nanoscale machining in theory, which provides a shortcut from micro phenomena to macro characteristics. On the other hand, the purpose of carrying out an MD simulation in many researches is not to replicate the experiment but to develop a theoretical understanding of the deformation and machining mechanisms (Faisal et al. 2014). Therefore, MD simulation has the potential for investigation of the deformation behavior of the workpiece of the subnanometric tool-workpiece contact in surface metrology. In this research, cost-effective MD simulations are carried out to characterize the subnanometric tool-workpiece contact process in the single point diamond microcutting and in-process surface metrology for the purpose of optimization of the FS-FTS. Based on the investigations of workpiece atom vibrations, a multi-relaxation time method is then proposed to reduce the influence of the atom vibrations. After confirmation of the feasibility of the multi-relaxation method for MD model stabilization, identification of the elastic-plastic transition contact depth of the workpiece is carried out. 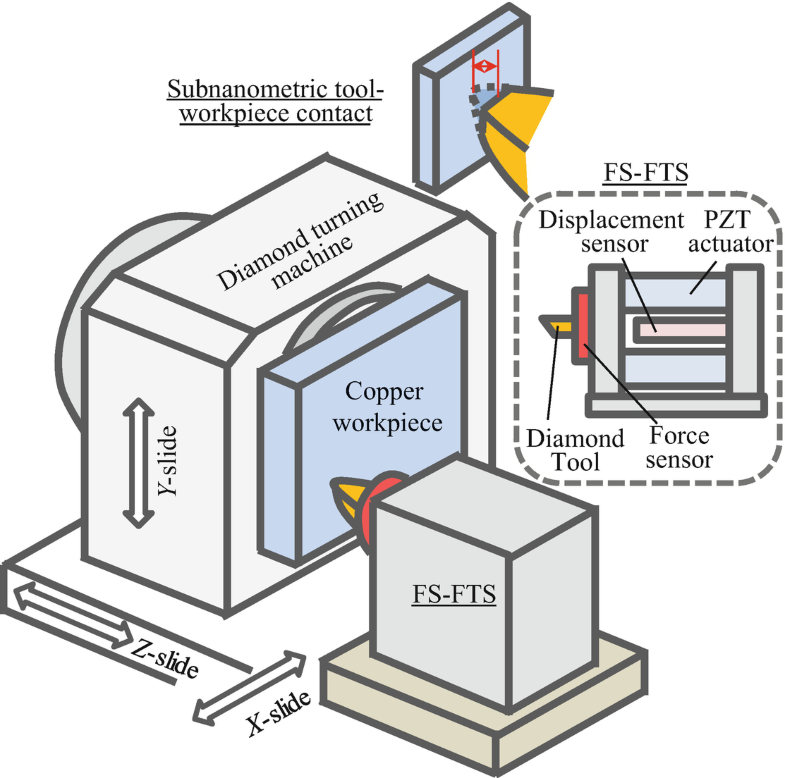 Figure 1 shows the schematic of the FS-FTS on a diamond turning machine where the tool-workpiece contact is established for in-press form measurement. The FS-FTS consists with a diamond tool, a force sensor, a PZT actuator, and a displacement sensor. The motion of the diamond tool along the Z-axis is servo controlled by the PZT actuator and the displacement sensor. The force sensor is applied to detect the contact force between the diamond tool and the workpiece surface. MD simulation is employed instead of experimentation for physically understanding the elastic and plastic deformation behaviors of the workpiece material in a subnanometric range when the workpiece surface is contacted with the diamond tool with specific cutting edge geometry. The process of subnanometric tool-workpiece contact can be treated as the nanoindentation of a workpiece using a diamond tool. Similar to a typical MD simulation of depth and load sensing indentation, a diamond tool and a workpiece are two fundamental elements in MD simulation of the subnanometric tool-workpiece contact. A round-nose diamond tool and a copper workpiece, which both are popular in the diamond microcutting, are employed in the tool-workpiece simulation. The schematic of a round-nose single point diamond tool and the enlarged view of the cutting edge over the arc AB are shown in Fig. 2a. The diamond tool has a round contour with a contour radius R in the range of millimeter. It is assumed that arc AB of the tool cutting edge is contacted with the workpiece surface in the process of the subnanometric tool-workpiece contact and Arc AB is a straight line. It can be seen from the enlarged view of the cutting edge tip over the arc AB as shown in Fig. 2a; the diamond tool has a nanometric edge sharpness denoted by ρ. 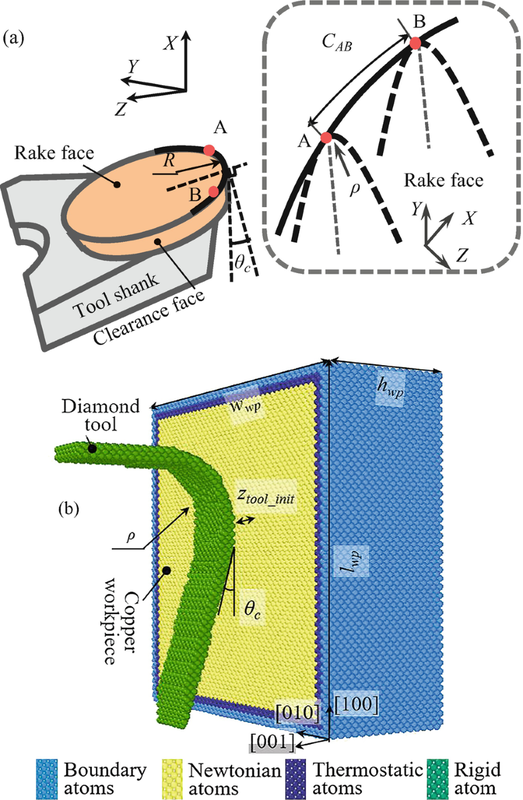 The rake angle and the clearance angle are other two important parameters of the geometry of the diamond tool. The rake angle and the clearance angle are the angles of the rake and clearance faces with respect to the normal of the workpiece surface, respectively. Figure 2b shows the MD model of the tool-workpiece contact. Diamond tool edge sharpness ρ is set to be 3 nm and the rake angle and the clearance angle θc are set to be 0° and 7°, respectively. Due to the size limitation of the MD simulation, only arc AB is modeled as the diamond tool with length Cab of 2.5 in the MD model shown in Fig. 2b. The lattice constant of diamond is 0.3567 nm. The initial position of the diamond tool along the Z-direction is denoted as ztool_ini, as shown in Fig. 2b. The workpiece is a single crystal copper substrate containing 119,940 atoms with a size of 15 nm (lwp) × 15 nm (wwp) × 6 nm (hwp) along the , , and  directions, respectively. The lattice constant of copper is 0.3610 nm. The reason of choosing copper as the material for the workpiece is in view of its recent emergence as the interconnect material of microelectronic devices. The copper workpiece size is significantly larger than the indentation contact area at the maximum contact depth; the spurious effects originating from the finite size of the workpiece thus can be avoided. 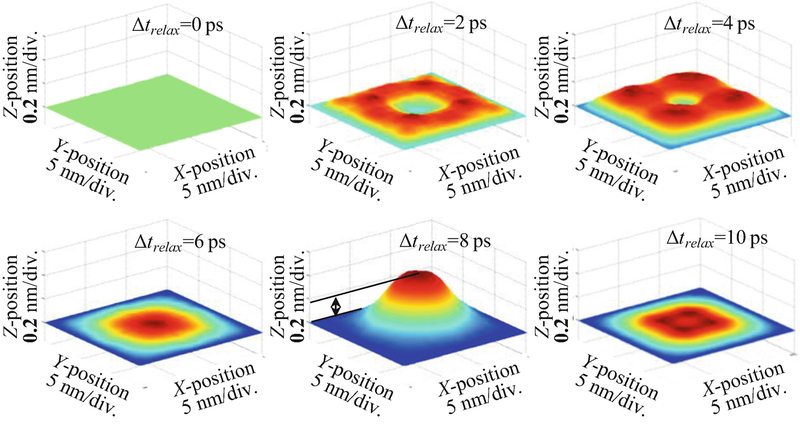 Similar to the typical workpiece model in MD simulations of nanoindentation, there are three kinds of atoms included in the workpiece, namely boundary atoms, thermostat atoms, and Newtonian atoms. 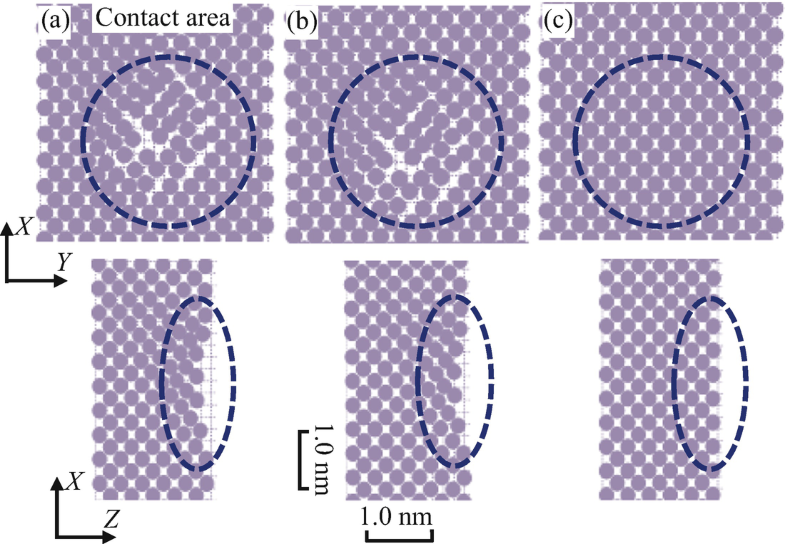 The three layers of the boundary atoms, which surrounded the workpiece except for the free (001) surface at z = 0, are kept to fix the workpiece in space, to prevent it from translating during the subnanometric tool-workpiece contact. The next three layers of the workpiece atoms adjacent to the boundary atoms are the thermostat atoms. During MD simulations, heat dissipation is carried out by keeping the thermostat atoms at a constant temperature by the Nosé-Hoover thermostat method (Nosé 2002). The simulation temperature is set to be 0.1 K at first to avoid the effect of thermal vibration on simulation results. The rest of the workpiece atoms are the Newtonian atoms. The Newton’s equations of motion are integrated with a velocity-Verlet algorithm with a time step of 1 fs. Since the contact forces are derived from the integration of the interaction potential with respect to the coordinate position of the atoms, the selection of the interaction potential is crucial to the reliability of the simulation results. The simulation models established in the research are composed of two types of atoms, copper atoms and diamond atoms. There are three different atomic interactions that can possibly occur between these atoms, namely the interactions between the workpiece copper atoms; the tool diamond atoms and the workpiece copper atoms; and the tool diamond atoms, as shown in Fig. 3. Since the diamond tool is regarded as a rigid body, the interactions between the diamond tool atoms are ignored in this simulation. The embedded atom method (EAM) potential, which has been specially developed for metals (Zhang and Tanaka 1997), can better describe the metallic bonding. The EAM potential gives a more realistic description of the behavior and properties of metals than the Morse potential. Therefore, the EAM potential is employed for describing the interactions between the copper atoms in the workpiece. 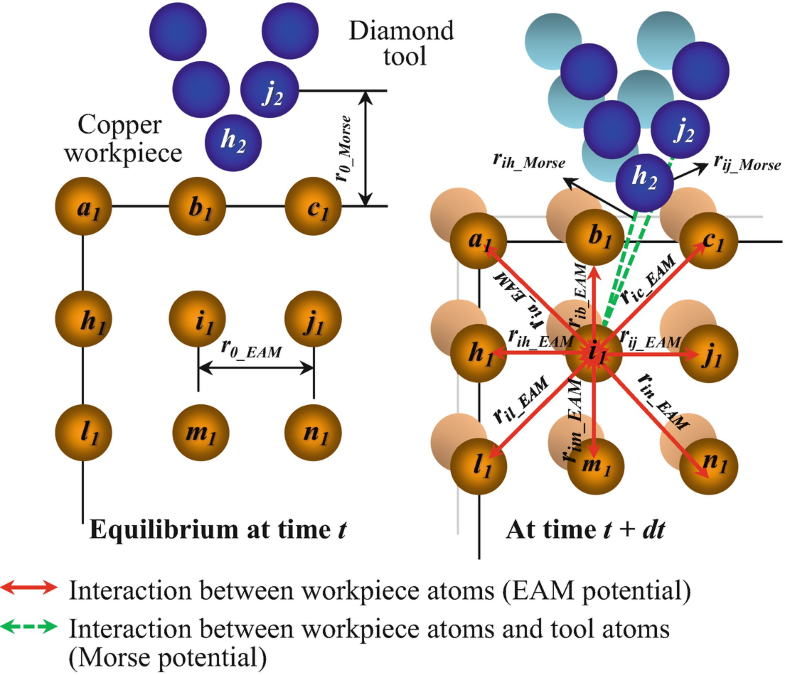 As there is no available EAM potential between the diamond atom and the copper atom, the interactions between the tool diamond atoms and the workpiece copper atoms are described by the Mores potential, which has been widely used in nanoindentations (Fang et al. 2003; Pei et al. 2009). The Mores potential between the copper atoms and the diamond atom with the parameters of D0 = 0.087 ev, α = 51.4 nm−1, and r0 = 0.205 nm. For the sake of clarity, the computational parameters of the simulation model are summarized in Table 1. A personal computer (PC) with an Intel (R) Core (TM) CPU of 3.5 GHz and a RAM of 16 GB is employed for saving the computation cost. A public domain computer code “Large-scale atomic/molecular massively parallel simulator” (LAMMPS) (Plimpton 1995) is implemented for the MD simulations of the subnanometric tool-workpiece contact. The Visual Molecular Dynamics (VMD) (Humphrey et al. 1996) is employed to visualize the positions of the workpiece atoms calculated by LAMMPS during the simulation. The type of defects on the workpiece is identified by using the Open Visualization Tool (OVITO) (Stukowski 2010). Similar to the MD simulation of depth and load sensing nanoindentation, the MD simulation of the tool-workpiece contact includes three subsequent steps, namely the relaxation step and the tool-workpiece contacting and retracting steps, respectively. Figure 4 shows a schematic of the procedure of the MD simulation of the tool-workpiece contact. The diamond tool is initially positioned at point A with a position of ztool_ini along the Z-direction. ztool_ini is larger than the equilibrium distance between the tool diamond atom and the workpiece copper atom in Morse potential. In the relaxation step, the MD model is relaxed in a canonical ensemble (Wang et al. 1991), in which the number of atoms, N; the volume of the model, V; and the specified temperature, T, are kept constant, from the initial state with the artificially assigned initial conditions to its natural, dynamically equilibrium condition by running the MD program over a relaxation time of Δtrelax. After running the MD program over Δtrelax in the canonical ensemble, the internal potential energy of the MD model will gradually reach equilibrium around the initial temperature based on the thermal dynamic theory (Cheong et al. 2001). After the system has reached its equilibrium state, the tool is approached to the workpiece surface z = 0 (point S) with a constant velocity of vtool. The diamond tool is penetrated into the workpiece surface until it reaches a command contact depth ztool_M at point M. This process is referred to as the contacting step. Then the diamond tool is retracted back to its original position (point A) with the same velocity vtool, which is referred to as the retracting step. The time of contacting step and retracting step for the diamond tool that travels from point A to point M and from point M to point A are ΔtAM and ΔtMA, respectively. Since the contact velocity is equal to the retract velocity, ΔtAM is equal to ΔtMA. 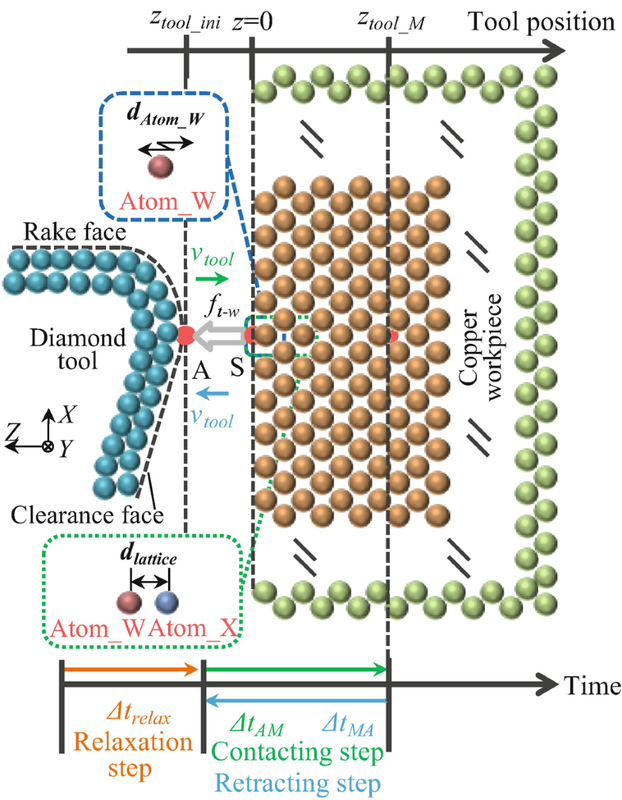 The interaction force ft−w between the diamond tool atoms and the copper workpiece atoms is calculated by the Morse potential between the copper atoms and the diamond atoms for investigation of the subnanometric tool-workpiece contact. The interaction force ft−w with respect to the tool position ztool is the summation of all the interatomic force components applied on the diamond tool atoms with a positive direction along the contact direction. Since the primary motivation of this simulation is to obtain the elastic-plastic transition contact depth and the corresponding contact force of the subnanometric tool-workpiece contact, the investigation of the relationship between ft−w and ztool is necessary. Taking into consideration that the tool-workpiece contact is in the subnanometric range, even a small instability induced by the vibrations of the workpiece atoms can generate large uncertainties in the MD simulation results. None of the researches has focused on the investigations of the stabilization of the MD model. In a regular lattice with harmonic forces between atoms, atoms keep vibrating around their equilibrium positions and the vibrations of neighbor atoms are not independent of each other (Okamoto 2014). The initial model of the MD simulation is constructed by positioning the atoms at the perfect lattice structures and the atoms are bound out to their average positions (Cheong et al. 2001). At first, the copper workpiece of the MD model is relaxed 10 ps under the temperature of 0.1 K without the diamond tool. 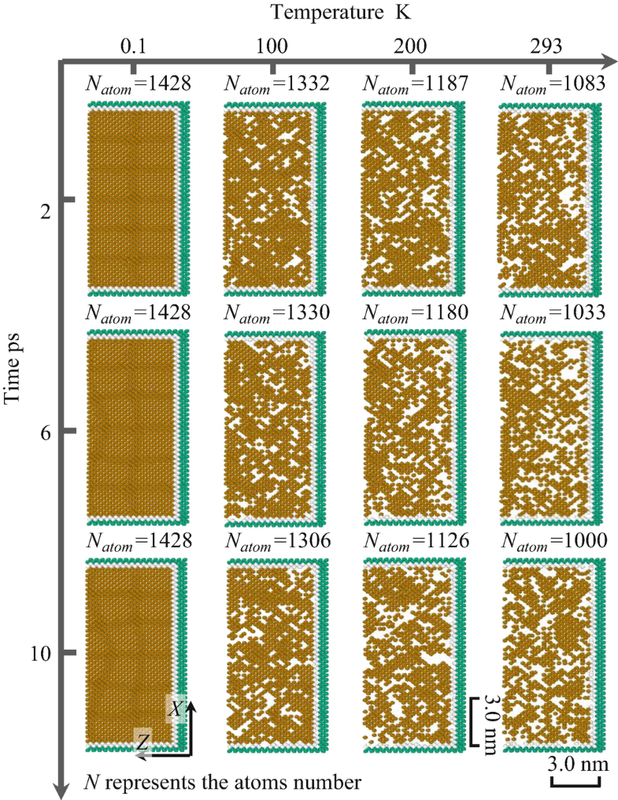 Figure 5 shows the free surface profile of the workpiece (z = 0) over the relaxation time Δtrelax at different moments, namely Δtrelax = 0 ps, 2 ps, 4 ps, 6 ps, 8 ps, and 10 ps, respectively. The color of the figure is drawn based on the coordinate position of the atoms at the free surface. It can be seen from the figure that the workpiece atom vibrations let the atom to leave its original position even at a low temperature of 0.1 K. The Z-directional displacement dAtom_W of the Atom_W at the center of the free surface of the workpiece over the relaxation time is shown in Fig. 6. 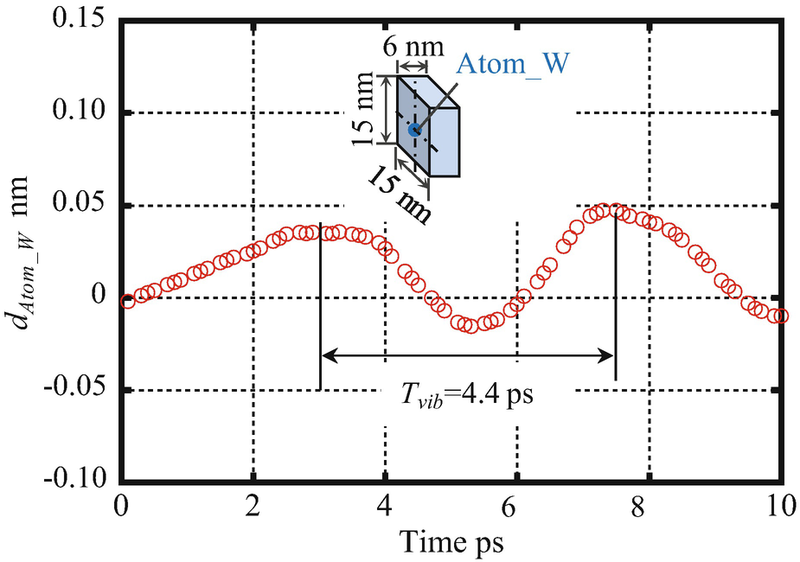 It can be seen from the figure that Atom_W keeps vibrating along the Z-direction with an amplitude dAtom_W of 0.05 nm and a period Tvib of 4.4 ps during the entire relaxation time. Figure 7 shows the internal potential energy of the workpiece over the relaxation step. The internal potential energy of −4.63 × 10−14 J drops to −4.95 × 10−14 J after a time ΔTsteady of 0.5 ps. As can be seen in Fig. 7, the internal potential energy keeps its steady state after ΔTsteady, which means the system has reached its equilibrium state in terms of internal potential energy. Similar simulation is also carried out on a small MD workpiece model, with a size of 7.5 nm (lwp) × 7.5 nm (wwp) × 3 nm (hwp), to investigate the effect of the workpiece volume on the workpiece atom vibrations. The result is shown in Fig. 8. It can be seen from the figure that the period and amplitude of the workpiece atom vibrations are reduced to 2.2 ps and 0.02 nm on a small workpiece MD model from that of 4.4 ps and 0.05 nm on a large workpiece MD model. It is verified that the workpiece volume is one of the dominating factors for workpiece atom vibrations. Simulations are then carried out on the MD model, shown in Fig. 2b, with the diamond tool. The initial position ztool_ini of diamond tool is set to be −0.15 nm and – 0.3 nm. The MD model is relaxed 10 ps and the diamond tool is kept stationary in the relaxation step. Figure 9a shows dAtom_W under the diamond tool located at various initial positions. The amplitude of dAtom_W is increased from 0.035 nm to 0.063 nm as ztool_ini increased from −0.3 nm to −0.15 nm, respectively. The increase of dAtom_W is caused by the external force, which is induced by the interactions between the tool diamond atoms and the workpiece copper atoms. Based on the Morse potential, the external force is increased with the decrease of the distance between the tool and workpiece. However, the external forces do not change the period Tvib of dAtom_W. Similar phenomena are also observed in the variation of the interaction force ft−w, as shown in Fig. 9b. As can be seen in Fig. 9b, the variation amplitude of ft−w at ztool_ini of −0.3 nm and −0.15 nm is evaluated to be −0.15 nN and −12.0 nN, respectively. The significant change of the force amplitude is due to the exponential relationship between the Morse potential and the tool-workpiece distance. ft−w varies periodically at each ztool with the same period Tvib of 4.4 ps. Therefore, it is indicated that the variation of ft−w is caused by the vibrations of workpiece atoms. After the relaxation step at ztool_ini of −0.30 nm, the tool is moved with a constant velocity vtool of 20 m/s to contact with the workpiece surface along the Z-direction. It should be noted that the velocity used in the MD simulations is several orders higher than that of actual experiment (10−6 m/s–10−9 m/s). A velocity of 1 m/s to 200 m/s is often chosen in most MD simulations of nanoindentation for the sake of reducing the computational time and cost (Zhu et al. 2011; Qiu et al. 2014). The command contact depth ztool_M is set to be 0.15 nm. Figure 10 shows ft−w-ztool curve in the relaxation and contacting steps. As can be seen in Fig. 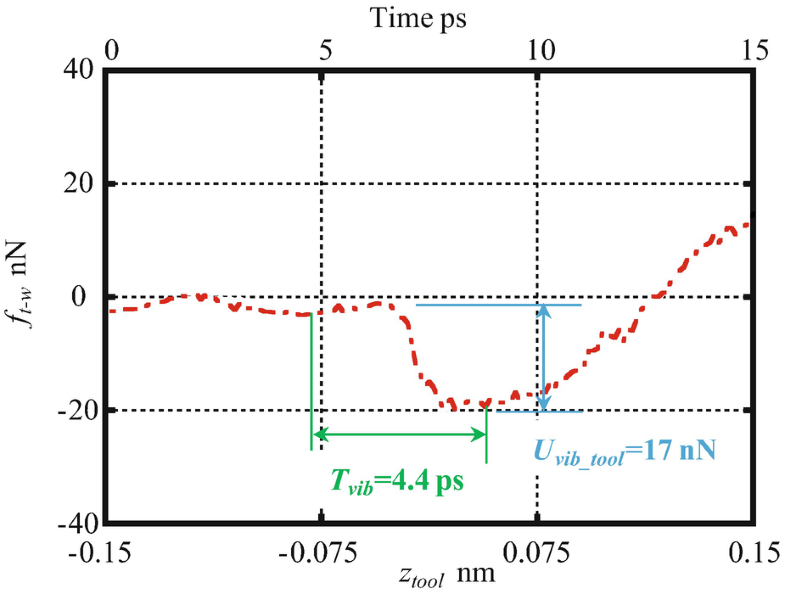 10, a periodic component with a period of approximately 4.4 ps, which is the same as that of Tvib shown in Fig. 6, is generated in ft−w-ztool curves before the tool reaches to ztool = 0. It is inferred that the periodic component should be induced by the vibration of the workpiece atoms. The amplitude of the periodic component Uvib_tool is evaluated to be 17 nN. As can be seen from the simulation results that even at a low temperature of 0.1 K, ft−w- ztool curve has an instability, which will influence the identification of the elastic-plastic contact depth of the subnanometric tool-workpiece contact. Since the vibration period is on the same order as the contacting operation time and/or the retracting operation time, a simple low-pass filtering or moving average method of the data, which is often used to remove the periodic component in data handling process, cannot be employed for ft−w-ztool curve. Thus, it is necessary to propose an effective method to reduce the instability and stabilize the MD model. where ztool_ini ≤ ztool ≤ ztool_M. In the group of tool-workpiece contact simulations, Δoffset, Δinterval, and N are set to be 5.6 ps, 1.1 ps, and 5, respectively. Stabilized ft−w-ztool curve of Fig. 10 over the relaxation and contacting steps by applying the proposed multi-relaxation time method is shown in Fig. 11. 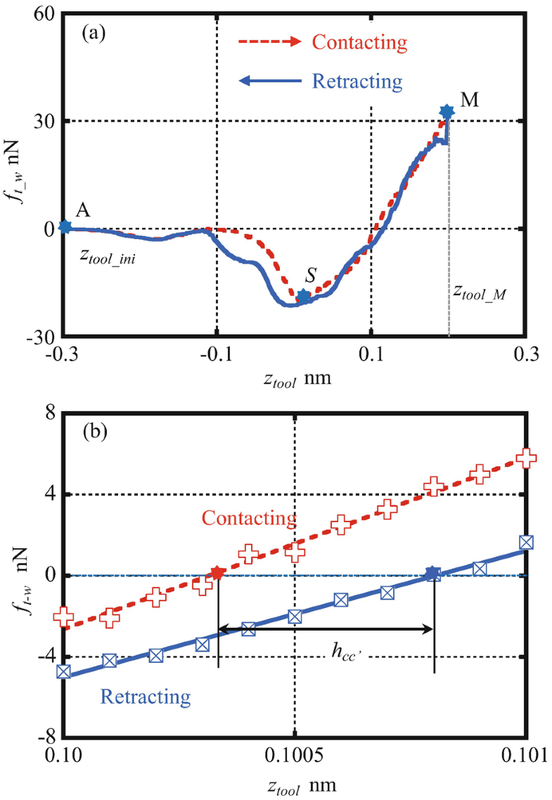 It can be seen from the figure that the period error component with a period of Tvib and uncertainty of Uvib_tool has been removed, from which the effectiveness and feasibility of the proposed methods for the reduction of the contact force instability and the stabilization of the MD simulation model are demonstrated. 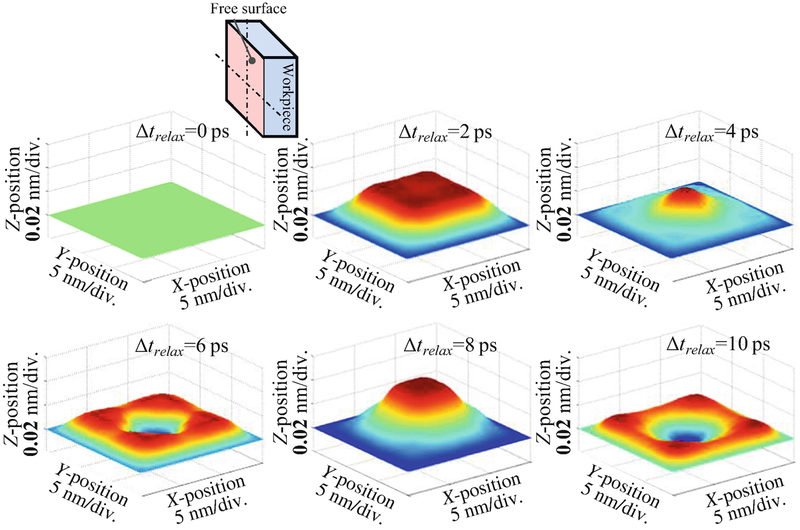 However, in real situation, the FS-FTS-based microcutting and on-machine surface form measurement are performed at a room temperature around 293 K. In order to make the simulation results more practically useful, the effectiveness of the multi-relaxation time method for reduction of the atom vibrations and stabilization of the MD model should be verified under the condition of room temperature. MD simulations of tool-workpiece contact are then carried out at a wide temperature range, from 0.1 K to 293 K. The computational parameters, except for temperature, are similar with that in Table 1. Figure 12 shows the number of the workpiece atoms, Natom, of one layer on XZ-plane under various temperatures over the relaxation step. The higher the temperature is, the more intensively its atoms oscillate around their equilibrium position. Thus, Natom decreases with the increase of temperature. Natom at the temperature of 0.1 K is kept constant of 1428 over the entire relaxation step due to low amplitude vibration. The Natom is reduced from 1332, 1187, and 1083 at Δtrelax = 2 ps to 1306, 1126, and 1000 at Δtrelax = 10 ps with respect to the temperature of 100 K, 200 K, and 293 K, respectively. 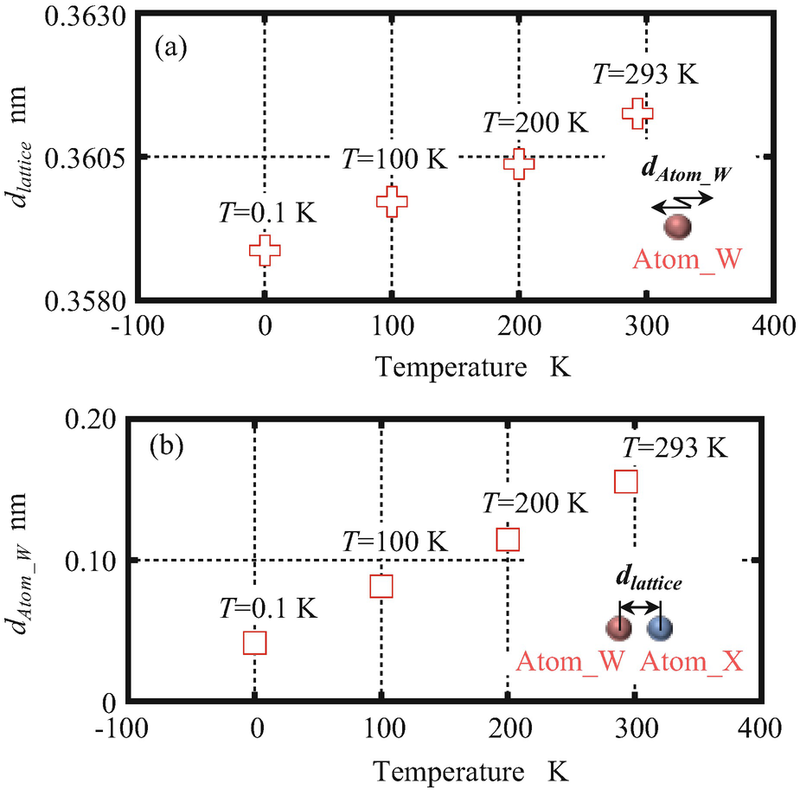 The calculated Z-directional displacement dAtom_W of the Atom_W (random atom of the workpiece) at different temperatures is summarized in Fig. 13a. 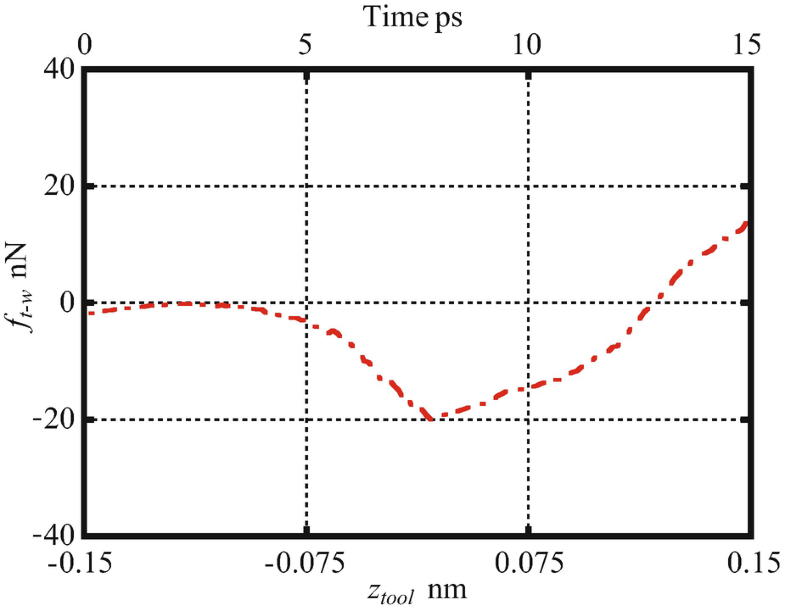 It can be seen from the figure that the amplitude of dAtom_W is increased from 0.034 nm to 0.067 nm, 0.093 nm, and 0.12 nm as the temperature increases from 0.1 K to 100 K, 200 K, and 293 K, respectively. The lattice constant dlattice of copper, which is the distance between two adjacent atoms (Atom_W and Atom_X) in the copper workpiece, is also evaluated at various temperatures. The evaluated results are shown in Fig. 13b. As can be seen that dlattice is raised from 0.3590 nm to 0.3600 nm, 0.3608 nm, and 0.3618 nm with the temperature increasing from 0.1 K to 100 K, 200 K, and 293 K, respectively. It is verified that the temperature significantly influences the performance of the MD model. The free surface profile of the workpiece without the diamond tool over the relaxation time at different moments is shown in Fig. 14. Similar to Fig. 5, the atoms are deviated from its original position due to the atom vibration. The Z-directional displacement dAtom_W of the Atom_W over the relaxation time is shown in Fig. 15. 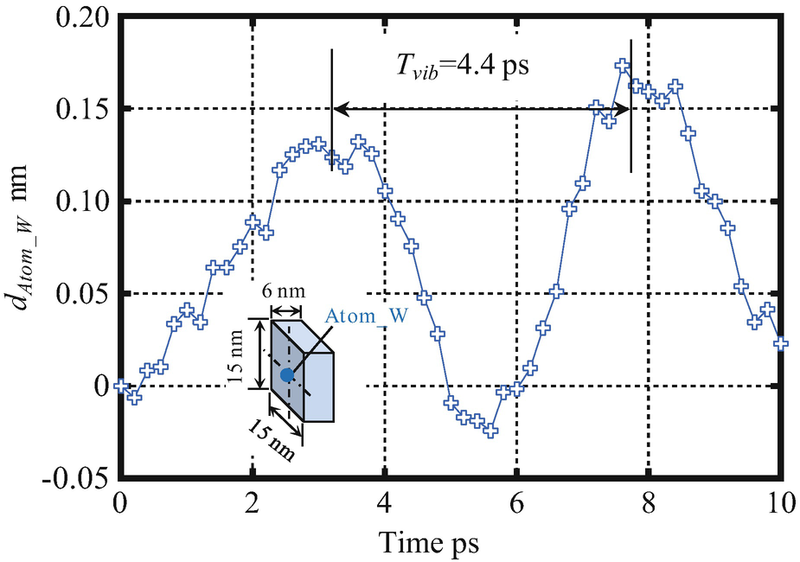 It can be seen from the figure that the Atom_M vibrates with an amplitude of 0.15 nm after an increase from that of 0.05 nm at the temperature of 0.1 K and a period Tvib of 4.4 ps over the entire relaxation step. Therefore, it is identified that although dAtom_W increases with the increase of the temperature, the period of the atom vibration remains the same at the temperatures of 0.1 K and 293 K. Figure 16a shows the instability of the ft−w-ztool curve in the relaxation and contacting steps at the initial temperature of 293 K. It can be seen from figure that ft−w-ztool curve has a periodical component, especially when the diamond tool is located at a position in the range from ztool = − 0.15 nm to ztool = 0 nm. The period of the error component is evaluated to be 4.4 ps and the uncertainty of it is approximately 23 nN. Figure 16b shows the stabilized ft−w-ztool curve by the proposed multi-relaxation time method. It can be seen from figure that the periodic vibration components is well-eliminated based on the multi-relaxation time method. The uncertainty induced by the error component is reduced 2 nN from 23 nN. It is verified that the multi-relaxation time method is effective for stabilization of the MD model over a wide temperature range up to the room temperature (Cai et al. 2016b). The multi-relaxation time method is employed in all the following simulations. After stabilization of the MD model, the identifications of the elastic-plastic transition contact depth of the copper workpiece under the diamond tool are carried out. In order to avoid the effect of thermal vibration on simulation results, the simulation temperature is set to be 0.1 K.
The workpiece material, copper, is a typical elastoplastic material (Aliofkhazrae 2014). If the tool-workpiece contacts with a small command contact depth ztool_M, the deformed copper workpiece returns to its original state without any contact marks on the workpiece surface after the diamond tool is retracted back from the workpiece surface in the retracting step. However, when ztool_M is larger than a threshold value, which is referred to as ztool_transition, the shear stress caused by the contact force between the diamond tool and the workpiece will be larger than the yield stress of the copper. 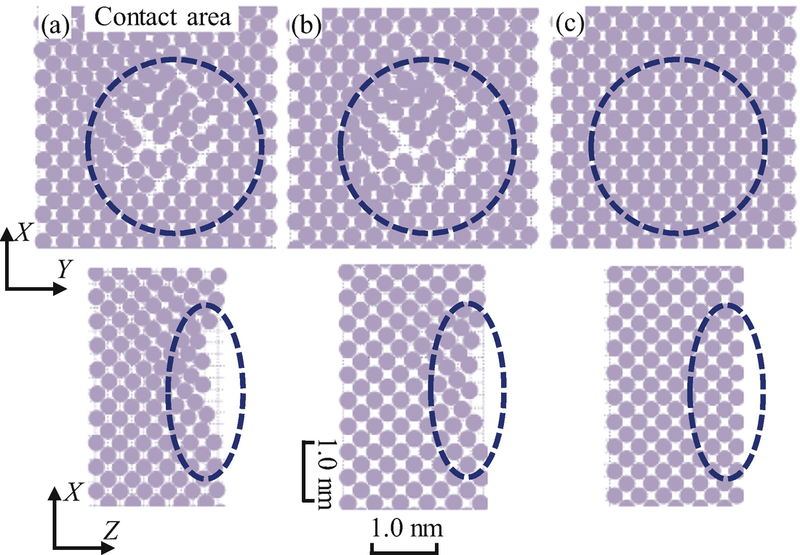 Consequently, the copper atoms are dislocated and the plastic deformation is generated on the workpiece (Müller et al. 2007). Thus, a contact mark will then generate on the workpiece surface after the contact force is released in the retracting step. The threshold ztool_transition and the corresponding ft−w_transition are referred to as the elastic-plastic transition contact depth and the elastic-plastic transition contact force, respectively. 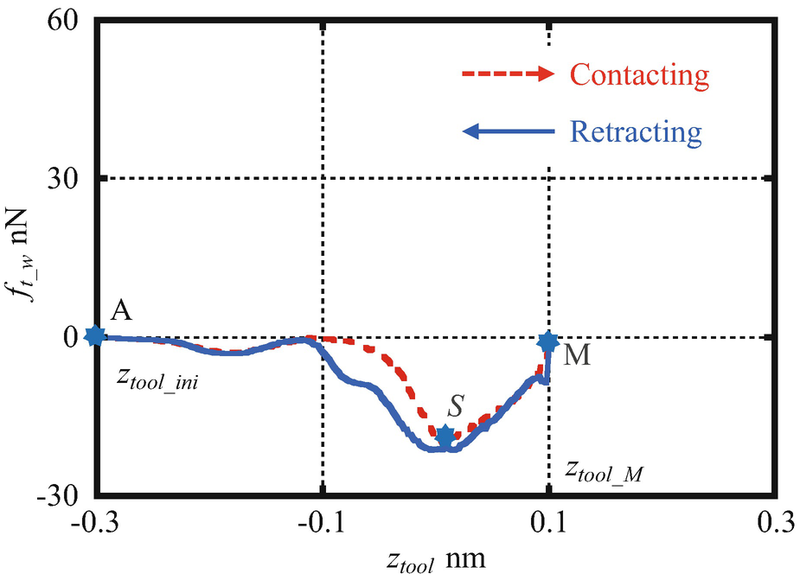 A rough ztool_transition is firstly identified from the ft−w-ztool curves during the contacting and retracting steps under various command contact depths ztool_M, which is set to be from 0.1 nm to 0.5 nm with a step of 0.1 nm. Contact force ft−w is obtained from the resultant force acting on the diamond tool, which is calculated by summing the forces in the Z-direction contributed to the copper atoms underneath the diamond tool. 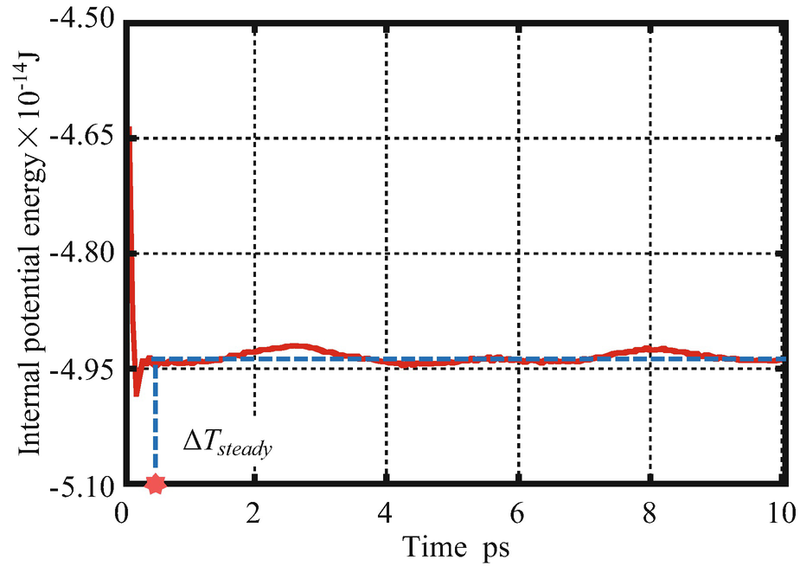 ft−w is the average force evaluated by the multi-relaxation time method from a group of MD simulations of tool-workpiece contact. ft−w-ztool curve of tool-workpiece contact at a command contact depth of 0.10 nm is shown in Fig. 17. A negative displacement of the diamond tool represents that the diamond tool has not yet contacted with the copper workpiece surface. A negative force in the figure denotes an attractive force existing between the diamond tool and the workpiece, while a positive force indicates a repulsive force between the diamond tool and the workpiece. When the diamond tool is brought to approach the workpiece surface, it firstly suffered from the attractive force, which is ascribed to be the long-range attractions between the diamond tool atoms and the copper workpiece atoms. The amplitude of ft−w decreases to −0.10 nN when ztool reaches, approximately, −0.10 nm. When the diamond tool reaches the workpiece surface at point S, the amplitude of the attractive force rapidly increases up to its peak value of 20 nN. At this point, the distance between the copper atoms at the free surface of the workpiece and the diamond atom at the bottom surface of the diamond tool is smaller than the equilibrium distance between the copper atom and the diamond atom in Morse potential, thus the diamond tool atoms and the workpiece copper atoms are suffered from repulsive force. However, most of the diamond tool atoms are still applied on attractive forces. Therefore, the total interaction force applied on the diamond tool is still attractive force. The interaction force is significantly influenced by the geometry of the tool edge. As the diamond tool indents into the workpiece, the interaction force ft−w becomes repulsive and increases with an increase of ztool up to the command contact depth ztool_M. However, due to the geometry of the diamond tool, most of diamond tool atoms still receives attractive force. As can be seen from Fig. 17, the attractive force is still dominant at point M. After the diamond tool arrives at the command contact depth, it continues to retract back to its original position point A. ft−w varies rapidly to a maximum attractive value at points S, and finally the attractive force reduces with a decrease of ztool until it returns to a free load state. At the free load state, there are no interactions between the tool diamond atoms and the workpiece copper atoms. Figure 18a shows ft−w-ztool curve when ztool is increased to 0.20 nm. ft−w becomes zero at point C where ztool is 0.11 nm, and then ft−w increases to the peak value of 33 nN when ztool reaches the command contact depth ztool_M·. ft−w decreases to zero again at point C’, which is different from point C, in the retraction step. Figure 18b shows a closed-up view of ft−w-ztool curve around points C and C’. The distance hCC’ between point C and point C’, which is referred to as the hysteresis interval, is evaluated to be 0.004 nm. ft−w-ztool curves, when ztool is at a commend contact depth of 0.30 nm and 0.40 nm, are omitted for the sake of clarity. hCC’ at a commend contact depth of 0.30 nm and 0.40 nm are evaluated to be 0.007 nm and 0.018 nm, respectively. The evaluated hCC’ at each ztool is drawn in Fig. 19. hCC’-ztool_M curve is fitted by polynomial equation. 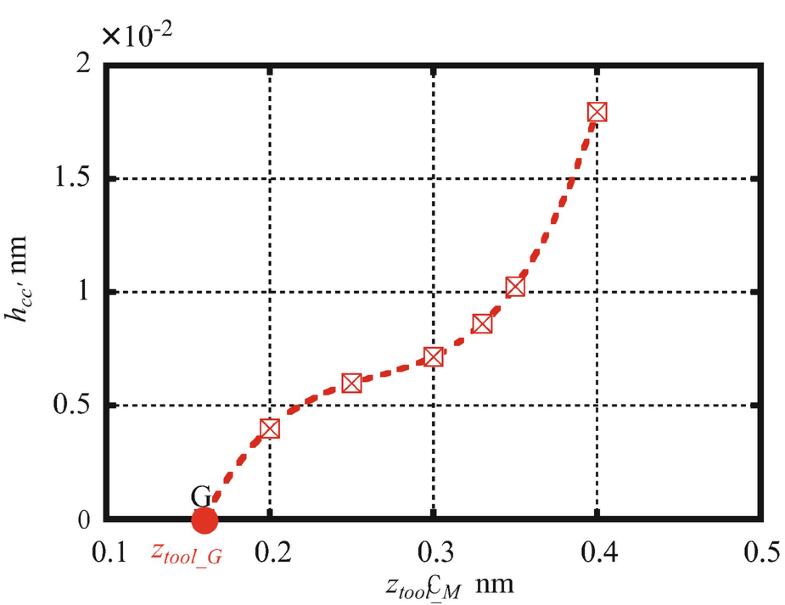 It can be seen from figure that the fitted curve interacts with horizontal axis at point G. ztool_G is ztool_M at point G and evaluated to be 0.17 nm. A nonzero hCC’ can be represented as the transition depth from the elastic deformation to plastic deformation. However, it can be seen from ft−w-ztool curves under various ztool_M that the simulation results are significant influenced by the adhesive interatomic interactions and the geometry of diamond tool. Thus there can be a large uncertainty by directly taking the nonzero hCC’ as the elastic-plastic transition contact depth ztool_transition of the subnanometric tool-workpiece contact. A more reliable method is proposed for identification of an accurate ztool_transition of the subnanometric tool-workpiece contact, which is a threshold value of the plastic tool-workpiece contact. As introduced above, when ztool_M is larger than the elastic- plastic transition contact depth ztool_transition, the lattice structure of the workpiece atoms on the free surface will be distorted from its original position after the removal of the diamond tool from the workpiece surface. Based on the fact that the defects remain in the lattice structures after the retracting step, a more accurate approximation of ztool_transition is thus identified to be ztool_M, in which the occurrence of the defects on the workpiece is confirmed. Thus, the defects in the lattice structure of the workpiece atoms on the free surface after the removal of the diamond tool are observed by increasing ztool_M from ztool_G of 0.17 nm, which is taken as the initial approximation of ztool_transition and is denoted by ztool_transition_ini. In the simulation, ztool increases with a step of 0.01 nm from ztool_transition_ini. The 0.01 nm is fine enough from the viewpoint of practical applications of the tool-workpiece contact. The positions of the workpiece atoms in the lattices structures at the XY plane and the XZ plane when position of the diamond tool is located at point M, point C’, and point A are visualized by VMD, as shown in Fig. 20. ztool_M is set to be 0.17 nm. The atom position at point M represents the points where ztool reaches the command contact depth ztool_M. The atom position at point C’ represents ft−w is equal to zero during the retracting step, and the atom position at point A corresponds to the final profile of the workpiece surface. It is observed that the atom positions are changed from their original position in Fig. 20a. Some of distorted atoms return back to their original position by the elastic recovery of workpiece when the diamond tool retracts to point C’, as shown in Fig. 20b. Finally, no defect occurs on the workpiece surface due to the return of all the distorted atoms to their original lattice structure by the adhesion interaction between the diamond tool atoms and the workpiece atoms when the diamond tool retracts to its original position point A (Wu et al. 2012), as shown in Fig. 20c. Therefore, the processes of the deformations of the workpiece indicate that there are no contact-induced defects on the workpiece surface when the command contact depth is set to be 0.17 nm. It is clearly demonstrated that 0.17 nm is not the elastic-plastic transition contact depth. ztool_G in Fig. 19 cannot be directly used to identify the accurate transition depth for the subnanometric tool-workpiece contact. Similar investigations are then carried out by increasing ztool with a step of 0.01 nm. Figure 21 shows the atom positions under the command contact depth of 0.33 nm. Since the command contact depth is increased, more distorted lattice structures are observed at point M and point C’ as shown in Fig. 21a and b compared with those in Fig. 20a and b. However, the distorted lattice structures still return to their original lattice structures when the diamond tool is retracted to point A as shown in Fig. 21c, which is the same as the case when the command contact depth is set to be 0.17 nm. However, a different result is observed when the command contact depth is increased to be 0.34 nm. As can be seen in Fig. 22c, there are same defects generated on the workpiece surface after the diamond tool retracts to point A. It can be therefore identified that 0.34 nm is the accurate elastic-plastic transition contact depth ztool_transition. 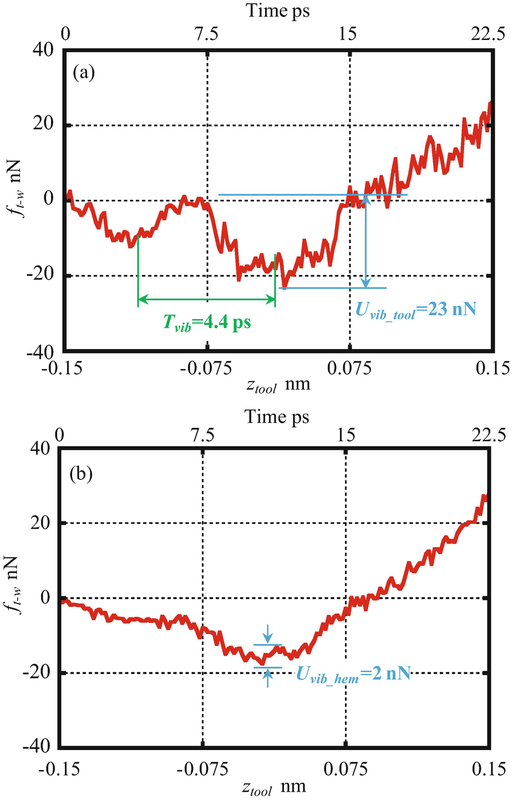 The corresponding contact force ft−w_transition at ztool of 0.34 nm is evaluated to be 93 nN from the ft−w-ztool curve. Centrosymmetry Parameter (CSP) (Stukowski 2012) is widely used to distinguish the types of the defects in the lattice structures of the workpiece atom in the process of nanoindentation/nanocutting. The so-called CSP can be employed to quantify the local loss of centrosymmetry at an atomic site. 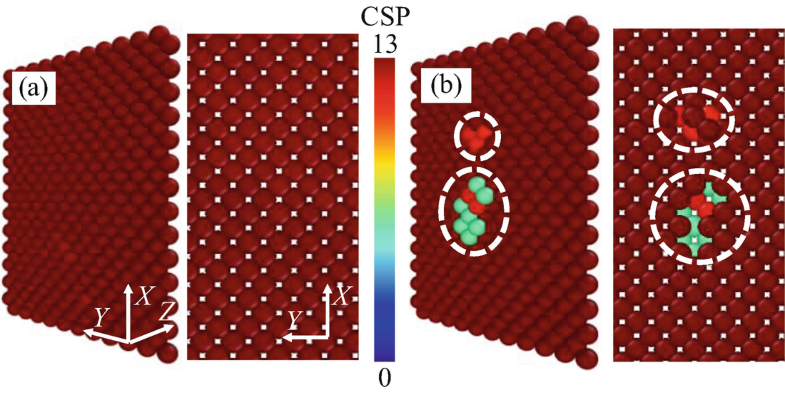 The CSP value increases from 0 for perfect FCC lattice to positive values for defects and atoms close to free surface (Zhao et al. 2009). As for copper atom, the CSP value below 0.5 represents it location in a perfect lattice structure, while the CSP value above 0.5 means the copper atoms in a defective lattice structure (Zhao et al. 2009). Figure 23a and b shows the CSP value of the workpiece atoms over a small area underneath the diamond tool when the diamond tool is retracted to point A with the command contact depth of 0.33 nm and 0.34 nm, respectively. Only atoms with CSP above 0.5 are made visible in the figures to make the defects clear. It can be seen from Fig. 23a that no defect occurs on the workpiece surface since the distorted atoms return to their original position by the elastic recovery of the workpiece and the adhesion interaction between the diamond tool atoms and the workpiece atoms. There are some defects generated on the workpiece surface when ztool is set to be 0.34 nm, as shown in Fig. 23b. The results in Fig. 23 was in a good agreement with that in Fig. 22. Based on the above simulation results, it should be noted that the evaluated ztool_transition of 0.34 nm and ft−w_transition of 93 nN are corresponding to the diamond tool with an arc AB length of 2.5 nm and a sharpness of 3.0 nm in the MD model. Therefore, the evaluated value of 0.34 nm for ztool_transition cannot be directly treated as the threshold value of the plastic tool-workpiece contact. The actual length C’ab of arc AB is approximately eliminated to be 2.3 μm for a command contact depth of 0.34 nm for a diamond tool with a nose radius of 2 mm in actual applications. In order to estimate the corresponding contact force applied to the actual tool cutting edge over C’ab – which is referred to as the transition contact force, ft−w_transition, for the actual diamond tool – the transition contact force ft−w_transition over Cab should be expanded based on the geometrical of the diamond tool shown in Fig. 2a. f′t-w_transition is then calculated to be approximately 0.09 mN. It should be noted that f′t-w_transition is only a rough estimation of the transition contact force. The resolution of the force sensor used in the previously designed FS-FTS is 0.06 mN (Chen et al. 2015a). Therefore, the force sensor can be employed in the next generation FS- FTS with an optimization of the force sensor electronics for a reduced noise level. On the other hand, the above simulations are carried out at a low temperature of 0.1 K, which are different from the practical tool-workpiece contact. In order to obtain a more reliable estimation of the elastic-plastic transition contact depth of the copper workpiece for practical application of the tool-workpiece contact, large-scale simulations with an extended sharpness of the tool at the room temperature, which is the practical experiment condition of the microcutting/form measurement, should be carried out. MD simulations have been performed to investigate the tool-workpiece contact in a force sensor-integrated fast tool servo (FS-FTS) for single point diamond microcutting and on-machine surface metrology. A periodic component, which was determined by the size of the MD model, with a dominant period has been observed even after the simulation system has been relaxed to its equilibrium state at a low temperature of 0.1 K. It has been verified that periodical component was induced by the subnanometric vibrations of the workpiece atoms. The period of the workpiece atom vibrations was influenced by the volume of the MD model size, and the simulation temperature only affected the amplitude of the workpiece atom vibrations. Based on the fact that the dominant vibration component had a certain period, a multi-relaxation time method has been proposed for reduction of the atom vibrations and stabilization of the MD simulation model. The accurate interaction force in the tool-workpiece contact is evaluated from the average of the ft−w-ztool data sets obtained in a group of MD simulations of tool-workpiece contact with identical simulation parameters except relaxation times in the relaxation step. 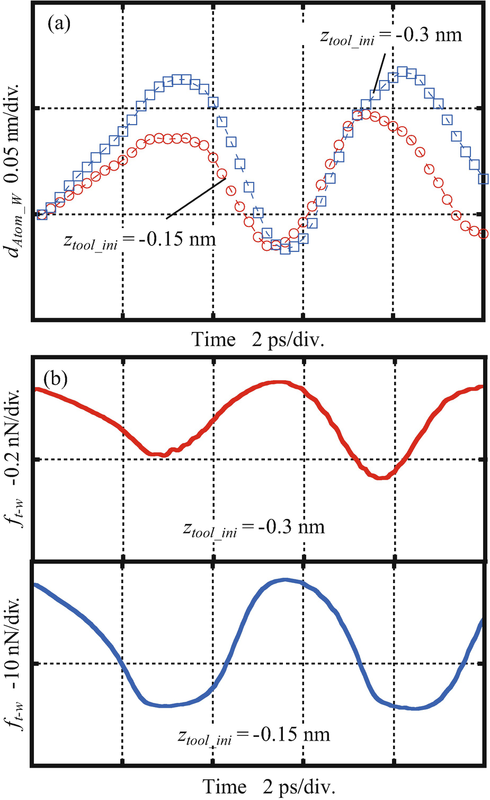 The uncertainty of the ft−w-ztool curves at the temperature of 0.1 K and 293 K is reduced from 17 nN and 23 nN to 0.1 nN and 2 nN by using the proposed multi-relaxation time method, from which the effectiveness of the proposed multi-relaxation time method has been confirmed over a wide temperature range up to the room temperature. The identification of an accurate elastic-plastic transition contact depth of the workpiece of the subnanometric tool-workpiece contact in diamond microcutting and on-machine surface metrology has been carried out. According to the contact force and tool displacement curve, a rough elastic-plastic transition contact depth of the workpiece is firstly calculated. Then a method has been proposed for evaluating an accurate elastic-plastic transition contact depth by observing the occurrence of the defects induced on the workpiece surface after the diamond tool was retracted from the workpiece surface. As a result, for the diamond tool with the specified geometry in this research, the transition contact depth was identified to be 0.34 nm where the featured point defects were observed on the workpiece surface. Identification of the elastic-plastic transition contact depth of the subnanometric tool-workpiece contact at the room temperature of 293 K when a diamond tool with a practical edge sharpness of up to 30 nm – under which a practical microcutting and on-machine surface metrology are conducted – will be carried out in the next step of the research for the purpose of the optimization of the FS-FTS.